In 2005 Derek Soeder and Ryan Permeh, researchers from eEye Digital Security, presented eEye BootRoot. The technique used in their project wasn't new and had been popular in DOS times, but they first successfully used it in Windows NT Environment. 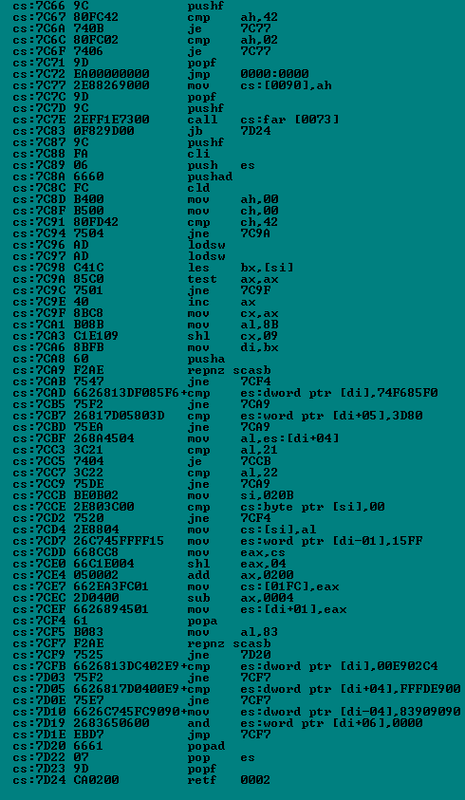 The eEye Digital Security researchers skipped one part - BootRoot didn't hide the real content of affected sectors like old DOS Stealth MBR viruses, but it had only been created to show the possible way to compromise Windows NT OS. Unfortunately, all the Windows NT family (including VISTA) still have the same security flaw - MBR can be modified from usermode. Nevertheless, MS blocked write-access to disk sectors from userland code on VISTA after the pagefile attack, however, the first sectors of disk are still unprotected ! At the end of 2007 stealth MBR rootkit was discovered by MR Team members (thanks to Tammy & MJ) and it looks like this way of affecting NT systems could be more common in near future if MBR stays unprotected. The installer of the rootkit writes the content of malicious kernel driver (244 736 bytes) to the last sectors of the disk (offset: 2 142 830 592) and then modifies sectors 0 (MBR), 60, 61 and 62. "39680","10:43:34,1365132","ldo2.tmp","848","CreateFile","\Device\Harddisk0\DR0","SUCCESS","Desired Access: Generic Read/Write, Disposition: Open, OpenResult: Opened"
"39690","10:43:34,1424517","ldo2.tmp","848","ReadFile","\Device\Harddisk0\DR0","SUCCESS","Offset: 0, Length: 512, I/O Flags: Non-cached"
"39769","10:43:34,2424965","ldo2.tmp","848","ReadFile","\Device\Harddisk0\DR0","SUCCESS","Offset: 2 142 830 592, Length: 512, I/O Flags: Non-cached"
"39770","10:43:34,2492468","ldo2.tmp","848","ReadFile","\Device\Harddisk0\DR0","SUCCESS","Offset: 2 142 831 104, Length: 512, I/O Flags: Non-cached"
"39771","10:43:34,2495318","ldo2.tmp","848","ReadFile","\Device\Harddisk0\DR0","SUCCESS","Offset: 2 142 831 616, Length: 512, I/O Flags: Non-cached"
"40463","10:43:34,5546049","ldo2.tmp","848","ReadFile","\Device\Harddisk0\DR0","SUCCESS","Offset: 2 143 185 408, Length: 512, I/O Flags: Non-cached"
"40679","10:43:34,7473241","ldo2.tmp","848","ReadFile","\Device\Harddisk0\DR0","SUCCESS","Offset: 30 720, Length: 512, I/O Flags: Non-cached"
"40692","10:43:34,7854862","ldo2.tmp","848","ReadFile","\Device\Harddisk0\DR0","SUCCESS","Offset: 31 232, Length: 512, I/O Flags: Non-cached"
"40705","10:43:34,7947558","ldo2.tmp","848","ReadFile","\Device\Harddisk0\DR0","SUCCESS","Offset: 31 744, Length: 512, I/O Flags: Non-cached"
"40718","10:43:34,8035200","ldo2.tmp","848","WriteFile","\Device\Harddisk0\DR0","SUCCESS","Offset: 2 142 830 592, Length: 244 736, I/O Flags: Non-cached"
"40719","10:43:34,8152900","ldo2.tmp","848","WriteFile","\Device\Harddisk0\DR0","SUCCESS","Offset: 30 720, Length: 512, I/O Flags: Non-cached"
"40720","10:43:34,8252619","ldo2.tmp","848","WriteFile","\Device\Harddisk0\DR0","SUCCESS","Offset: 31 232, Length: 512, I/O Flags: Non-cached"
"40721","10:43:34,8265515","ldo2.tmp","848","WriteFile","\Device\Harddisk0\DR0","SUCCESS","Offset: 31 744, Length: 512, I/O Flags: Non-cached"
"40722","10:43:34,8277706","ldo2.tmp","848","WriteFile","\Device\Harddisk0\DR0","SUCCESS","Offset: 0, Length: 512, I/O Flags: Non-cached"
The Rootkit dropper overwrites original MBR code and stores a copy in sector 62. The author of rootkit mostly used MBR loader code developed by eEye researchers, however the original code has been modified to patch the Windows kernel instead of NDIS driver. 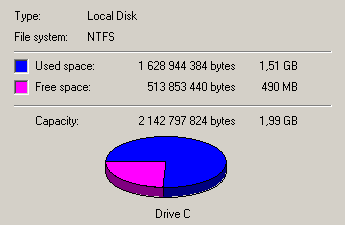 ; on a Windows NT-family system. MBR rootkit loader hooks INT 0x13 to control content of sectors loaded by NTLDR. It patches two areas of the kernel: the first contains the call of nt!IoInitSystem function and the second is the last page of the kernel image. At the beginning of start-up rootkit calls original nt!IoInitSystem function and then loads its own driver. 806ebe10 0f 20 c0 50 25 ff ff fe ff 0f 22 c0 2b ca 58 0f  . .P%.....".+.X. 806ebe50 fe ff ff ff e0 33 c0 61 ff 74 24 0c ff 54 24 08  .....3.a.t$..T$. 806ebe60 59 5a 60 87 cd e8 52 00 00 00 60 8b 6c 24 28 8b  YZ`...R...`.l$(. 806ebe70 45 3c 8b 54 05 78 03 d5 8b 4a 18 8b 5a 20 03 dd  E<.T.x...J..Z ..
806ebe80 e3 32 49 8b 34 8b 03 f5 33 ff fc 33 c0 ac 3a c4  .2I.4...3..3..:. 806ebe90 74 07 c1 cf 0d 03 f8 eb f2 3b 7c 24 24 75 e1 8b  t........;|$$u..
806ebeb0 03 c5 eb 02 33 c0 89 44 24 1c 61 c3 5b 55 68 b8  ....3..D$.a.[Uh. 806ebf10 68 00 00 10 80 57 ff d0 55 68 62 e0 07 37 ff d3  h....W..Uhb..7..
806ebf40 51 6a 00 ff d7 50 56 8b ce 96 33 d2 52 52 52 ff  Qj...PV...3.RRR. 806ebf60 40 ff d0 8b 46 3c 03 c6 50 8b 50 50 52 52 6a 00  @...F<..P.PPRRj. 806ebf70 ff d7 97 59 57 32 c0 f3 aa 5f 58 60 8b 48 54 f3  ...YW2..._X`.HT. 806ebf90 60 03 72 14 03 7a 0c 8b 4a 10 e3 02 f3 a4 61 83  `.r..z..J.....a. The main part of rootkit loader opens "\? ?\PhysicalDrive0" and reads the content of the malicious kernel driver from the disk. Rootkit uses its own procedure to load image sections to the memory and in the last stage the loader calls driver's entry point. +0x008 ObjectName       : 0xf9e63804  "\? ?\PhysicalDrive0"
+0x004 Buffer           : 0x81bf074e  "\? ?\PhysicalDrive0"
To hide the real content of MBR and other sectors from AV scanners rootkit hooks "\Driver\Disk" IRP_MJ_READ. Normally, when API reads sector 0 (MBR), rootkit modifies disk IRP_MJ_READ call and returns copy of original MBR stored in sector 62. The second hook (IRP_MJ_WRITE) protects it from being deleted/overwritten. +0x00c ServiceKeyName   : _UNICODE_STRING "Disk"
+0x01c DriverName       : _UNICODE_STRING "\Driver\Disk"
+0x004 Buffer           : 0xe1403358  "\Driver\Disk"
+0x024 HardwareDatabase : 0x8068de90  "\REGISTRY\MACHINE\HARDWARE\DESCRIPTION\SYSTEM"
+0x004 Buffer           : 0x805ceb98  "\REGISTRY\MACHINE\HARDWARE\DESCRIPTION\SYSTEM"
+0x01c DriverName       : _UNICODE_STRING "\Driver\PartMgr"
The malicious kernel driver is loaded at the last stage of boot process. The driver as the main part of this rootkit is responsible for the network communication and hiding real content of affected sectors. and the kernel part of the scanner could read MBR by using original pointer of \Driver\Disk -> MajorFunction[IRP_MJ_READ] = CLASSPNP!ClassReadWrite. If the content of sectors is not identical, the machine has been infected. To remove rootkit from infected machine you can simply use "Recovery Console" command: fixmbr. 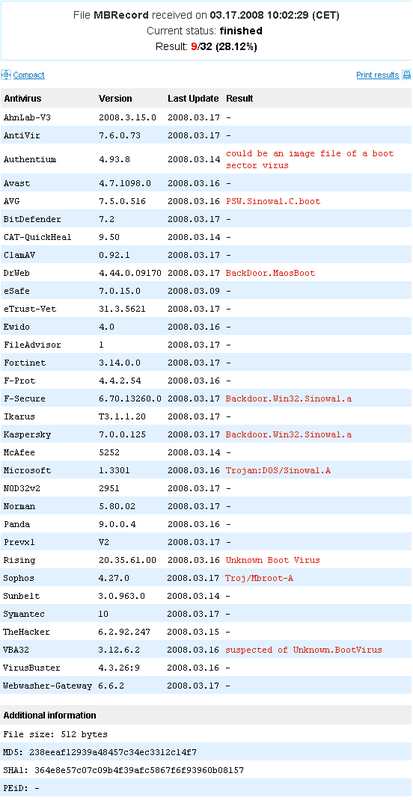 After a month, the author of the rootkit, released improved version of the malware. The main part of rootkit is almost identical to the previous one, and the changes concerning the installer. The previous version of the installer was modifying disk sectror via the standard Windows API functions. This method of infection of the MBR could be easly intercept by security applications, so the latest version uses special driver developed for the direct disk sectors access. When we are thinking, how to ensure protection against this threat, we should remember, that BIOS MBR protections and all software based solutions could failed, when the attacker will move malicious code from the MBR to the partition boot record. The partition boot record has the same potential like MBR and also could be used to compromise the OS. Hopefully, new technologies like TPM will help improve the security. The author of the rootkit released another improved version of the malware. The rootkit gang decided to continue "mouse and cat game", and to be more effective against AV scanners and removal tools, the changes concerning the MBR sector code, as well as now malware uses few tricks to cheat removal tools . To deceive few available detection/removal tools ( including GMER ) new version of rootkit modifies original pointers to CLASSPNP!ClassReadWrite in CLASSPNP.SYS!ClassInitialize function and pointers of \Device\CdRom0 MajorFunction table. The previous version of GMER finds original pointer of CLASSPNP!ClassReadWrite in \Device\CdRom0 MajorFunction table, so now, it cannot read infected MBR. 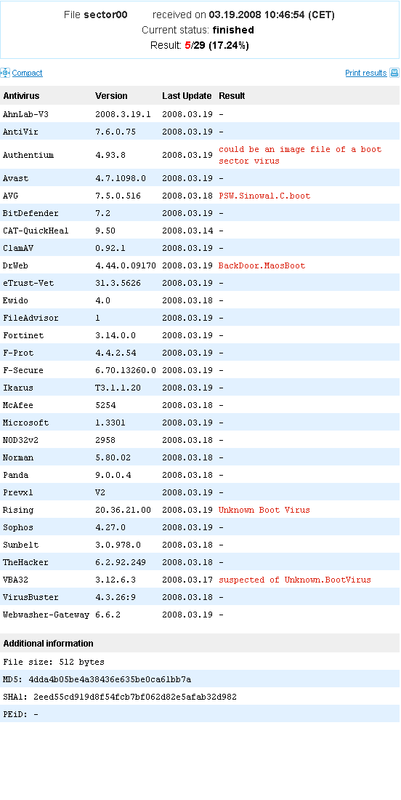 However, all these new malware tricks will imply more changes visible in the log - see below old GMER 1.0.12 scan. 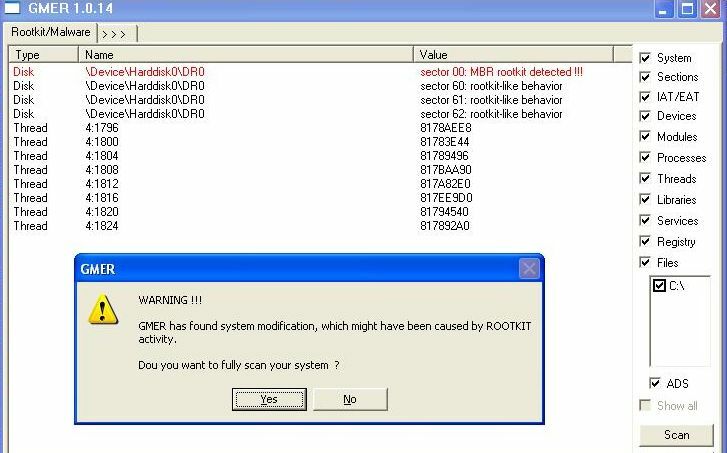 To detect/remove this rootkit, please use latest version of mbr.exe tool or GMER. MBR rootkit infection detected ! MBR INT 0x13 hook detected ! malicious code @ sector 0x3fdc80 size 0x1ca ! copy of MBR has been found in sector 62 ! original MBR restored successfully ! All possible options are available after running command: "mbr -?" To detect and remove latest variant of rootkit please use mbr.exe version 0.3.1 or newer. Warning: possible MBR rootkit infection ! malicious code @ sector 0x0100A75A ! PE file found in sector at 0x0100A770 ! MBR rootkit infection detected ! Use: "mbr.exe -f" to fix. Warning: possible TDL4 rootkit infection ! TDL4 rootkit infection detected ! Use: "mbr.exe -f" to fix.